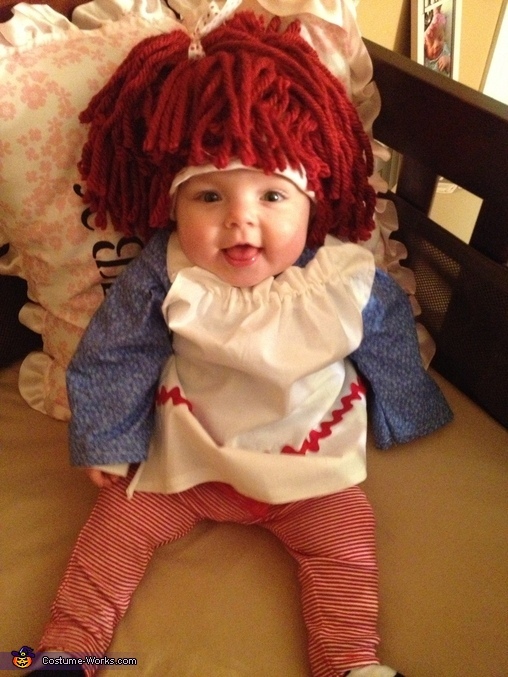 Leah is 5 moths old wearing a made-by-mommy Raggedy Ann costume! The idea came from a childhood doll that mom had and the instructions came from Pinterest (of course!!) Mom made the dress and apron by going to a sewing class to learn how to make simple items and the leggings are candy cane leggings for Christmas! :) the hat was the hardest part, but it is essentially red thick yarn sewn onto an infant hat. I learned the hard way that babies do not like an entire spool of yarn sewn to their heads! SOOOO Cuuute!Great job! especially for a first time sewing project! Too freakin cute!!!!!! Great job Mom! leah is adorable as raggedy ann and that expression on her face shows she loves it"!! and very proud of how cute she looks. what a doll!! good job mom!!! Leah is a adorable. Great job on the costume. I ever seen. good job. Leah has the bubbly personality to portray this costume. GREAT CHOICE AND GREAT JOB MOMMY!!!! Cutest raggedy an ever! Great job!